When Harry Shearer announced he was leaving The Simpsons last year, it was big news. After all, Shearer, like the rest of the principal cast, has been playing his roles on the series since 1989, and a Shearer exit would take along indispensable mainstays like Monty Burns, Smithers, Principal Skinner, and Ned Flanders, along with supporting Spingfieldians like Kent Brockman, Reverend Lovejoy, Otto, Jasper, and [fill in your own Shearer favorite]. When the Simpsons powers-that-be announced those parts would simply be recast and not respectfully retired (as were characters voiced by late co-stars Marcia Wallace and Phil Hartman), the statements that came out had a tinge of that time Kirk Van Houten got canned from the cracker factory to them. As shocking as the prospect of a Shearer-less Simpsons was, anyone who’s followed the Shearer-Simpsons relationship over the years knows it was a long time coming. 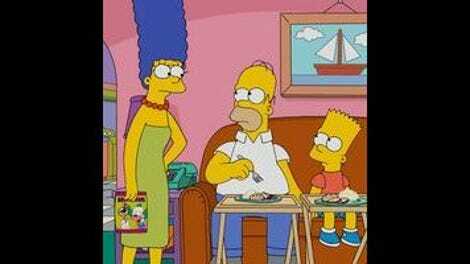 Apart from the fact that the now 72-year-old Shearer has remained an ambitious and busy guy outside of the show, he’s also been one of most vocal critics of The Simpsons’ perceived decline in quality since as far back as season 15 or so. On The Simpsons’ side, that can’t have endeared Shearer to the people he’s worked with for a quarter-century, and, indeed, if you read, say, any book about the history of Saturday Night Live (where Shearer spent two short, unhappy stints) the feeling comes across from coworkers that while Shearer’s undeniably smart, creative, and talented, he’s also a hard person to get along with. This is all to introduce the idea that “Trust But Clarify” is the first Simpsons script credited to Harry Shearer. There’s no indication I can find that such an event was part of quid pro quo for Shearer’s eventual return to the show before the start of this season, but it’s not out of the question either. Going in to the episode, I was more intrigued than usual for an early season episode with no big event or guest stars to recommend it. (Sorry episode guest star Dan Rather—you did fine, playing yourself.) Apart from the fact that I’m always interested in what Shearer’s up to, the idea of the show essentially being turned over to him, considering his history with it—good and bad—guarantees Simpsons aficionados will take special notice. I’d love to say that “Trust But Clarify” is a revelation. Or some sort of statement of what the show can be from Shearer. Instead, however, it’s a decent episode of The Simpsons, nothing more. A single writer’s credit on an episode hardly means that, in this case, The Simpsons became Harry Shearer’s The Simpsons—there’s a lot of rewriting and collaboration that goes into making any show. (Not written by Aaron Sorkin, at least). And sign me up for any oral history of the behind-the-scenes creation of the episode. But Shearer gets the sole writing credit here, and, on the basis of what’s on the screen, he ground a few axes, tossed in some decent jokes, and turned out an above-average episode. The flaws aren’t anything new to latter-day Simpsons. Scattershot plotting and pacing, with a B-story (Homer gets a makeover to get ahead at work) that could (and, indeed has been) an episode on its own. The main story, about Lisa recruiting the fired Kent Brockman to help her expose Krusty’s latest, horrifyingly unsafe product (formaldehyde-laced snacks), has an A- and B-story of its own. That leaves Homer dangling, his journey, like Homer himself, booted out the door with a few harsh words and an inky footprint on the back from Mr. Burns. In the end, “Trust But Clarify” is pretty forgettable in the grand scheme, although hardly negligible. It’s not fair to the episode to measure it against the higher expectations caused by Shearer’s heightened involvement, but it’s also not unreasonable to think that the multi-talented Shearer’s writing credit here might have nudged it into some more interesting territory, either. When Marge takes Homer for a makeover, we see the ol’ Springfield Mall has seen better days. Among the hobo encampments and falling giant letters, stores include: The Duller Image; Bruised Banana Republic; Boarders, No Books; The 9 Cent Store; and Bed, Bath & Beware. There’s a subplot about Homer’s anthropomorphized ambition being a gruff, buff spur for his desire to advance at work. It’s not especially memorable, although the sight gag of Homer high-fiving the li’l guy by smacking his own skull is pretty good. Carl does ask about high-fiving when everyone only has four fingers. Lenny has some funny Lenny-isms upon seeing the newly promoted Tibor’s office, marveling at the picture of a nondescript lighthouse on the wall, and how the mini-colas from Tibor’s mini-fridge make him look like he’s a giant when he drinks them.